In her Saturday op-ed column, New York Times writer Maureen Dowd reported that Joe Biden is thinking about running for the Democratic nomination. According to Dowd, Biden’s decision was prompted by the dying wish of his son, Beau Biden. “Beau was losing his nouns and the right side of his face was partially paralyzed. But he had a mission: He tried to make his father promise to run, arguing that the White House should not revert to the Clintons and that the country would be better off with Biden values. When Beau was dying, the family got rubber bracelets in blue — his favorite color — that said ‘WWBD,’ What Would Beau Do, honoring the fact that Beau was a stickler for doing the right thing. Once the entire media finished wiping the tears from their hardened eyes, they rushed to confirm whether or not Biden is actively considering a run. The general consensus: Biden has resumed talks that were put on the backburner while Beau Biden was sick. 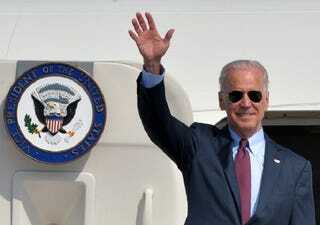 The Associated Press reports that Biden is likely to make a final decision in September. Also part of the consensus: Biden is likely to cause concern for Hillary Clinton. But who knows what will happen; the 2016 election is still 463 long days away.